Tooth enamel is one of the four major tissues that make up the tooth in humans and many other animals, including some species of fish. It makes up the normally visible part of the tooth, covering the crown. The other major tissues are dentin, cementum, and dental pulp. It is a very hard, white to off-white, highly mineralised substance that acts as a barrier to protect the tooth but can become susceptible to degradation, especially by acids from food and drink. In rare circumstances enamel fails to form, leaving the underlying dentine exposed on the surface. Enamel is the hardest substance in the human body and contains the highest percentage of minerals, 96%, with water and organic material composing the rest. The primary mineral is hydroxyapatite, which is a crystalline calcium phosphate. Enamel is formed on the tooth while the tooth develops within the gum before it erupts into the mouth. Once fully formed, enamel does not contain blood vessels or nerves. Remineralisation of teeth can repair damage to the tooth to a certain degree but damage beyond that cannot be repaired by the body. The maintenance and repair of human tooth enamel is one of the primary concerns of dentistry. The normal color of enamel varies from light yellow to grayish (bluish) white. At the edges of teeth where there is no dentin underlying the enamel, the color sometimes has a slightly blue or translucent off-white tone, easily observable on the upper incisors. Since enamel is semitranslucent, the color of dentin and any material underneath the enamel strongly affects the appearance of a tooth. The enamel on primary teeth has a more opaque crystalline form and thus appears whiter than on permanent teeth. Enamel formation is part of the overall process of tooth development. Under a microscope, different cellular aggregations are identifiable within the tissues of a developing tooth, including structures known as the enamel organ, dental lamina, and dental papilla. The generally recognized stages of tooth development are the bud stage, cap stage, bell stage, and crown, or calcification, stage. 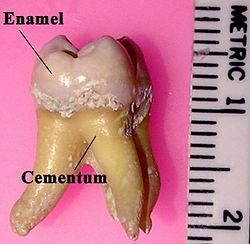 Enamel formation is first seen in the crown stage. In the maturation stage, the ameloblasts transport substances used in the formation of enamel. Histologically, the most notable aspect of this phase is that these cells become striated, or have a ruffled border. These signs demonstrate that the ameloblasts have changed their function from production, as in the secretory stage, to transportation. Proteins used for the final mineralization process compose most of the transported material. The noteworthy proteins involved are amelogenins, ameloblastins, enamelins, and tuftelins. How these proteins are secreted into the enamel structure is still unknown; other proteins, such as the Wnt signaling components BCL9 and Pygopus, have been implicated in this process. During this process, amelogenins and ameloblastins are removed after use, leaving enamelins and tuftelin in the enamel. By the end of this stage, the enamel has completed its mineralization. The high mineral content of enamel, which makes this tissue the hardest in the human body, also makes it susceptible to a demineralization process that often occurs as dental caries, otherwise known as cavities. Demineralization occurs for several reasons, but the most important cause of tooth decay is the ingestion of fermentable carbohydrates. Tooth cavities are caused when acids dissolve tooth enamel: Enamel is also lost through tooth wear and enamel fractures. Sugars and acids from candies, soft drinks, and fruit juices play a significant role in tooth decay, and consequently in enamel destruction. The mouth contains a great number and variety of bacteria, and when sucrose, the most common of sugars, coats the surface of the mouth, some intraoral bacteria interact with it and form lactic acid, which decreases the pH in the mouth. The critical pH for tooth enamel is generally accepted to be pH 5.5. When acids are present and the critical pH is reached, the hydroxyapatite crystals of enamel demineralize, allowing for greater bacterial invasion deeper into the tooth. The most important bacterium involved with tooth decay is Streptococcus mutans, but the number and type of bacteria varies with the progress of tooth destruction. 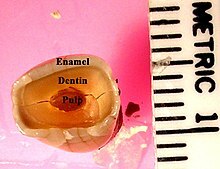 Though enamel is described as tough, it has a similar brittleness to glass, making it, unlike other natural crack-resistant laminate structures such as shell and nacre, potentially vulnerable to fracture. In spite of this it can withstand bite forces as high as 1,000 N many times a day during chewing. This resistance is due in part to the microstructure of enamel which contains processes, enamel tufts, that stabilize the growth of such fractures at the dentinoenamel junction. The configuration of the tooth also acts to reduce the tensile stresses that cause fractures during biting. Because enamel is vulnerable to demineralization, prevention of tooth decay is the best way to maintain the health of teeth. Most countries have wide use of toothbrushes, which can reduce the number of dental biofilm and food particles on enamel. In isolated societies that do not have access to toothbrushes, it is common for those people to use other objects, such as sticks, to clean their teeth. In between two adjacent teeth, floss is used to wipe the enamel surfaces free of plaque and food particles to discourage bacterial growth. Although neither floss nor toothbrushes can penetrate the deep grooves and pits of enamel, good general oral-health habits can usually prevent enough bacterial growth to keep tooth decay from starting. Genetic variations, in humans, might contribute to the intrinsic structural integrity of the enamel, and to its predisposition to demineralization or attack from bacteria. Despite fluoridation's detractors, most dental professionals and organizations agree that the inclusion of fluoride in public water has been one of the most effective methods of decreasing the prevalence of tooth decay. Fluoride can be found in many locations naturally, such as the ocean and other water sources. The recommended dosage of fluoride in drinking water depends on air temperature. Fluoride catalyzes the diffusion of calcium and phosphate into the tooth surface, which in turn remineralizes the crystalline structures in a dental cavity. The remineralized tooth surfaces contain fluoridated hydroxyapatite and fluorapatite, which resist acid attack much better than the original tooth did. Fluoride therapy is used to help prevent dental decay. Fluoride ion, as an antimicrobial, may activate bacteria fluoride-induced genes associated with fluoride riboswitches. The combination of fluoride ion and QAS (Quaternary ammonium salts) was found stronger antimicrobial effect on many oral bacteria associated with dental decay, including S. mutans. Furthermore, whereas topical fluoride, found in toothpaste and mouthwashes, does not cause fluorosis, its effects are now considered more important than those of systemic fluoride, such as when drinking fluorinated water. However, systemic fluoride works topically as well with fluoride levels in saliva increase also when drinking fluoridated water. Lately, dental professionals are looking for other ways to present fluoride (such as in varnish) or other mineralizing products such as Amorphous calcium phosphate to the community in the form of topical procedures, either done by professionals or self-administered. Mineralization of the incipient lesion instead of restoration later is a prime goal of most dental professionals. Researchers at the University of Southern California have developed an amelogenin-chitosan peptide hydrogel which entraps calcium and phosphorus mineral ions from saliva, forming a highly oriented enamel-like layer, restoring up to 80% of the hardness of normal enamel. Nonetheless, enamel can sometimes be removed before there is any decay present. The most popular example is the dental sealant. In the past, the process of placing dental sealants involved removing enamel in the deep fissures and grooves of a tooth, followed by replacing it with a restorative material. Presently, it is more common to only remove decayed enamel if present. In spite of this, there are still cases where deep fissures and grooves in enamel are removed in order to prevent decay, and a sealant may or may not be placed depending on the situation. Sealants are unique in that they are preventative restorations for protection from future decay, and have been shown to reduce the risk of decay by 55% over 7 years. ^ "(PDF) Severe Plane-Form Enamel Hypoplasia in a Dentition from Roman Britain". ResearchGate. Retrieved 9 January 2019. ^ a b M. Staines, W. H. Robinson and J. A. A. Hood (1981). "Spherical indentation of tooth enamel". Journal of Materials Science. 16 (9): 2551–2556. Bibcode:1981JMatS..16.2551S. doi:10.1007/bf01113595. ^ a b Cantù, Claudio; Pagella, Pierfrancesco; Shajiei, Tania D.; Zimmerli, Dario; Valenta, Tomas; Hausmann, George; Basler, Konrad; Mitsiadis, Thimios A. (7 February 2017). "A cytoplasmic role of Wnt/β-catenin transcriptional cofactors Bcl9, Bcl9l, and Pygopus in tooth enamel formation". Sci. Signal. 10 (465): eaah4598. doi:10.1126/scisignal.aah4598. ISSN 1945-0877. PMID 28174279. ^ Armstrong W.G. ; Pääkkö, P; Kerttula, R; Taikina-Aho, O; Tuuponen, T; Hassi, J (1968). "Origin and nature of the acquired pellicle". Proceedings of the Royal Society of Medicine. 61 (9): 923–930. PMC 1902619. PMID 5679017. ^ Darling A.I. ; Pääkkö, P; Kerttula, R; Taikina-Aho, O; Tuuponen, T; Hassi, J (1943). "The Distribution of the Enamel Cuticle and Its Significance". Proceedings of the Royal Society of Medicine. 36 (9): 499–502. PMC 1998608. PMID 19992694. ^ Bradway S.D. ; Bergey E.J. ; Scannapieco F.A. ; Ramasubbu N.; Zawacki S. & Levine M.J. (1992). "Formation of salivary-mucosal pellicle: the role of transglutaminase". Biochem. J. 284 (2): 557–564. doi:10.1042/bj2840557. PMC 1132674. PMID 1376115. ^ Salas, M.M.S. ; Nascimento, G.G. ; Huysmans, M.C. ; Demarco, F.F. (1 January 2015). "Estimated prevalence of erosive tooth wear in permanent teeth of children and adolescents: An epidemiological systematic review and meta-regression analysis". Journal of Dentistry. 43 (1): 42–50. doi:10.1016/j.jdent.2014.10.012. ISSN 0300-5712. PMID 25446243. ^ "Tooth Enamel Defined". GogoSmile. Retrieved 4 August 2018. ^ Larsen MJ, Nyvad (1999). "Enamel erosion by some soft drinks and orange juices relative to their pH, buffering effect and contents of calcium phosphate". Caries Res. 33 (1): 81–7. CiteSeerX 10.1.1.464.7695. doi:10.1159/000016499. PMID 9831784. ^ Gandara, BK; Truelove, EL (1999). "Diagnosis and management of dental erosion". The Journal of Contemporary Dental Practice. 1 (1): 16–23. PMID 12167897. ^ Braun, S; Bantleon, HP; Hnat, WP; Freudenthaler, JW; Marcotte, MR; Johnson, BE (1995). "A study of bite force, part 1: Relationship to various physical characteristics". The Angle Orthodontist. 65 (5): 367–72. doi:10.1043/0003-3219(1995)065<0367:ASOBFP>2.0.CO;2 (inactive 16 February 2019). ISSN 0003-3219. PMID 8526296. ^ Xu, H. H.; Smith, D. T.; Jahanmir, S.; Romberg, E; Kelly, J. R.; Thompson, V. P.; Rekow, E. D. (1998). "Indentation damage and mechanical properties of human enamel and dentin". Journal of Dental Research. 77 (3): 472–480. doi:10.1177/00220345980770030601. PMID 9496920. ^ a b Chai, H.; Lee, J. J.; Constantino, P. J.; Lucas, P. W.; Lawn, B. R. (2009). "Remarkable resilience of teeth". PNAS. 106 (18): 7289–7293. Bibcode:2009PNAS..106.7289C. doi:10.1073/pnas.0902466106. PMC 2678632. PMID 19365079. ^ Selwitz RH, Ismail AI, Pitts NB (2007). "Dental caries". Lancet. 369 (9555): 51–9. doi:10.1016/S0140-6736(07)60031-2. PMID 17208642. ^ Breaker, R.R. (2012). "New Insight on the Response of Bacteria to Fluoride". Caries Research. 46 (1): 78–81. doi:10.1159/000336397. PMC 3331882. PMID 22327376. ^ "Caries diagnosis and risk assessment. A review of preventive strategies and management". J Am Dent Assoc. 126 (Suppl): 1S–24S. 1995. doi:10.14219/jada.archive.1995.0371. PMID 7790681. ^ Twetman S (September 2009). "Caries prevention with fluoride toothpaste in children: an update". Eur Arch Paediatr Dent. 10 (3): 162–7. doi:10.1007/bf03262678. PMID 19772846. ^ "Tissue regeneration: Researchers create gel that regrows tooth enamel, eliminates pain associated with tooth decay". Dentistry IQ. 23 November 2015. ^ Richard Gawel (2 December 2016). "Startup's Prototype Gel Regrows Enamel and Halts Decay". Dentistry Today. ^ Summitt et al., p. 191. ^ a b Pastore L, Carroccio A, Compilato D, Panzarella V, Serpico R, Lo Muzio L (2008). "Oral manifestations of celiac disease". J Clin Gastroenterol (Review). 42 (3): 224–32. doi:10.1097/MCG.0b013e318074dd98. PMID 18223505. ^ a b Harris, p. 7: see section titled "X-Linked Inheritance"
^ "Evolution: Tooth-enamel similarities". Nature. 485 (7399): 419. 2012. Bibcode:2012Natur.485Q.419.. doi:10.1038/485419a. ^ Bentov, S.; Zaslansky, P.; Al-Sawalmih, A.; Masic, A.; Fratzl, P.; Sagi, A.; Berman, A.; Aichmayer, B. (2012). "Enamel-like apatite crown covering amorphous mineral in a crayfish mandible". Nature Communications. 3 (5): 839. Bibcode:2012NatCo...3E.839B. doi:10.1038/ncomms1839. PMC 3382302. PMID 22588301. "FAQ Category: Tooth Enamel". Dental Health Directory. Listgarten, Max A. (8 May 1999). "Cementum: Developmental Abnormalities". History of the Periodontum. University of Pennsylvania and Temple University. Archived from the original on 5 July 2007. Retrieved 9 December 2016. "Fluoride in Drinking Water". EPA.gov. Environmental Protection Agency.